Atapattu Walawwa Residence of Gooneratne and Dias Abeysinghe Families of Galle is a richly illustrated antiquarians miscellany on one of Sri Lanka’s well preserved treasure trove walawwa’s – an ancient manor house – found in Galle the Capital of the Southern Province of Sri Lanka. Janaka Goonetileke, a consultant Obstetrician and Gynaecologist in Britain, with his marriage to Dharshani Dias Abeysinghe the sole heir to the Atapattu Walawwa – the ancient manor house, which has survived in the family for well nigh 23 decades, has gone in search of his wife’s roots and have documented same for posterity. The book states that the other contributors of this work are Senaka Bandaranayake and Susil Sirivardana. 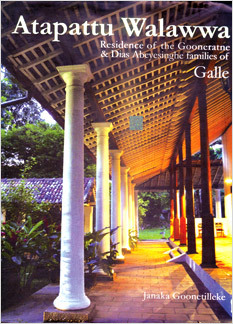 I read and re-read this fascinating book what amazes me as a Gallean is the designing part accredited to Albert Dharmasiri, the magnificent photographs of Malaka Weligodapola, special portfolio of drawings executed by Thushara Illeperuma and the two drawings of Babara Sansoni from her Vihara and Verandahs. Atapattu Walawwa contains 172 pages of pure bliss, with each page evoking the contributors affection for this unique manor house. You cannot open this book without wanting to go there. Just after the book launch at the Barefoot Gallery, Bambalapitiya on July 3 at 6.00 pm, the following Saturday morning it whetted my curiosity to be in Galle to visit Atapattu Walawwa to find out the indeciphered date inscription bearing 1742 that is found at the entrance of the floor of this edifice which was embedded in my memory. Apparently it is a later inscribed inscription. There are several salient features found in the contents to this book entitled Atapattu Walawwa sub titled Residence of Gooneratne and Dias Abeysinghe families. They are namely: a Protected monument, The setting, Architecture, Stage of Construction, Technology, Garden and Courtyards, Furniture, Daily life, Social Background, Edmund Rowland Gooneratne A Biographical sketch, The Gooneratne Mudalindarama, The Cemetery and the selected writings of E R Gooneratne. The most remarkable salutary feature found in the book is the biographical sketch (from page 136 to 161) of that foremost erudite oriental scholar Edmund Rowland Gooneratne the 19th-20th century diarist of par excellence, who bestrode like a mighty colossus in the Sri Lankan nationalist Buddhist renaissance and carved niche in the annals of national resurgence in the country. The book contains a rare photograph of the Sri Maha Bodhiya of Anuradhapura dated 1917. From the word Atapattu a term used in feudal administration the title of the book – it appears that it is a misnomer. Atapattu though there is a family name in existence has no connection with the Sinhala word ATA (eight). There are no eight pattus in Galle. This is the holder of the post of chieftain or Mudaliyar in the officialdom or Mudaliyardom who was in close proximity to the Governor. The other part of the title of the book is Walawwa. According to the Sinhala Dictionary it is derived from the Tamil word “walauw” which denotes that it is the residence of an aristocrat. What I have learnt that, when learnt on Galle, that there were de facto Walawwa’s and de jure Walawwa’s. The Atapattu Walawwa is a de jure walawwa. The family has held it by virtue of their office for several generations. At page 8-9 of this book refers to China Koratuwa (Chinese Quarter) more commonly known as China Gardens or Cheena Koratuwa. This is the place where in 1810 the British got down the Chinese to cultivate their vegetables. The Sinhalese word Koratuwa denotes the place where they cultivate vegetables. The other shortcoming found in the book vide at page 9 is that: “the ‘China Koratuwa’ the Chinese quarter probably recalling a time before the Dutch intervention disrupted the intra-Asian trading networks”. Also please refer to pages 18-20 of Gaalu Ithihasaya (History of Galle) by E V G William 1967 which also supports this position. Somasiri Devendra has erred in his article titled: Trilingual Inscription of Galle that Cheng Ho’s visit in 1409 is connected with China Gardens or Cheena Koratuwa of Galle. At page nine in paragraph 2 parenthetically the book states that: “(Valuvatta – the land of Walawwas today a municipal ward of that name).” The municipal ward system was repealed abolished in 1976. Walauwawatta was never a municipal ward of the 15 municipal wards that prevailed in the Galle Municipal Council. The ward No. 2 was China Gardens and the ward No. 3 was Bazaar (Kadaveediya) to which the area of Walauwwatta belonged. According to old deeds and plans “Kekiribokkawatta” in China Gardens where the Mahagala walauwwa (vide page 11 of the book) is situated is the place where the Chinese grew the Sinhalese vegetable kekiri. This book Atapattu Walawwa (vide: page 11) bears ample testimony to the fact that there had been seven walauwwas in the vicinity of the Walauwwa, that the list of Walauwwas in Sri Lanka ( Sri Lankave Walauw Namawaliya) written by Dr. Mirando Obeysekera is a haphazard incomplete work not only pertaining to Galle but on the Waluwwas of Sri Lanka. Once E.V.G. William told me that the Atapattu Walauwwa originally owned a large extent of land that went up to Minuwangoda junction where the tortoise shell shops in this junction drew income to the Walauwwa. It would have been a worthwhile study to go into the adjacent regional Survey General’s maps and plans on the area for the study to the extent of land originally owned by the Atapattu Walauwwa. My indefatigable, passionately curious study on Galle has found the least references on Atapattu Walauwwa the ancient manor house in books on Galle. The details are abound on Goonaratne and Dias Abeysinghe families in the All Saint’s Church records (Church minutes, Baptism registers, Marriage registers and the Burial registers) which substaintiates their allegiance to the Anglican Church and the British rulers. All Saint’s Church Fort Galle has had a vicar named Felix Dias Abeysinghe (1965-1975) Vernon Dias Abeysinghe (vide page 124) was also a warden of the Church. The rebel of the family of Mudaliyar Edmund Rowland. Gooneratne “Gentleman – Scholar of the Sri Lankan Renaissance” his fight against the system it appears that the British rulers have shown a sense of antipathy towards the family by not appointing any one thereafter for the said appointment. Furthermore, the History of Methodist Church in Ceylon edited by Rev. W.J.T. Small 1964 records the First Methodist School was found at the upper storey of the Atapattu Walauwwa. This is another point to the fact that the Walauwwa had a pride of place for liberal thinking. It was the family Gooneratne who was instrumental in establishing the Batemulla Sinhalese mixed school in Imaduwa which was later taken over by the Government in 1957. However, the remains interred in the vault of the Dutch Reformed Church of Fort Galle of “Don David De Alvis Attepattoe Modiliar of Galle” whose tombstone is paved on the floor of the Church who departed this life 5th October 1817 aged 43 years, 3 months and 17 days’ is cogent evidence to the fact that the post of Atapattu Mudaliyar did not remain with Gooneratne and Dias Abeysinghe families. J.P. Lewis in his monumental work, ‘List of Tombstones and Memorials’ does not record this tombstone. Furthermore, E.R. Gooneratne’s genealogy does not establish that the Atapattu Mudaliyar De Alvis belongs to their family. His tenure of Office it appears that it was only for 5 years after Don Bastian. All these evidence establish beyond doubt that the name Atapattu Walauwwa emerged as a manor house after the Atapattu Mudaliyar title was invested in Don Bastian Jayatilleke Gooneratne (1758-1812). This provides some credence to the legend that is recorded by Janaka Goonetileke on the origin of the Atapattu Walauwwa. The chapter that deals on furniture found from pages 109-116 of the book should have been written with the perusal of two authoritative works on the subject. Viz: Dutch Furniture – R.L. Brohier and European Furniture – Joseph Pearson J.R.A.S. (CB) article. None of the photographs depict furniture in a bedroom of the era. The timber should have been identified with the botanical names. The contributors have extensively used Sinhalese words in their contributions in the book. Had these Sinhalese words were identified with diacritical marks it would have been convenient in the interest of the readers. Arnold Wright, the editor of the Lloyd’s Press, in his prestigious monumental record. “Twentieth Century Impressions of Ceylon” published by the Lloyd’s Great Britain company in 1907, sheds more light on the Atapattu Walauwwa. Abeysinghe (at page 758-759) together with a photograph of Maha Mudaliyar Nicholas Dias Abeysinghe (Figure 2) and Abraham Dias Abeysinghe (at page 768), whose wedding photograph with Eva Tagora Gooneratne is amongst the few rare Sinhala Govigama elitists prominent ceremonies celebrated in 1903 in Galle is published in the rare opus, Janaka Goonetileke’s Atapattu Walawwa. The other only known elitist Karawa wedding ceremony recorded from Galle is provided by Norah Roberts in her compendium entitled Galle as quiet asleep. (at page 404) where that affluent aristocrat Charles Henry Soysa’s son, Arthur Soysa’s betrothal to Regina Perera Abeywardena of Closenberg fame held at the All Saint’s Church Galle which was reported in “London Daily Graphic” on 2nd March 1899. They were indeed landmarks in the heydays of Galle. The Atapattu Walauwwa has withstood the vagaries of time. It is a unique architectural legacy gifted to posterity. The families of Gooneratne and Dias Abeysinghe should be commended for their unremitting perseverance and the exemplary conduct to preserve this manor house for the future generation. Janaka and his wife Dharshani who continues the family tradition deserves from the Sri Lankans and the Galleans a special word of appreciation for bestowing this monumental saga, undoubtedly a veritable mine of information on Galle. Goonetileke’s Atapattu Walawwa is a kind of enthusiast’s guide’ to the unique Sri Lankan real estate in the by-gone era.